It is that time of year again when all the apples are falling off the trees and we have an abundance of green tomatoes that never ripened. Rather than letting our apples and tomatoes go to waste we decided to would make an Apple and Green Tomato Chutney. We would like to share with you our very easy to make Apple and Green Tomato Chutney Recipe which makes a lovely sweet and spicy accompaniment to cold meats, breads and cheeses. This recipe will make a large batch of Apple and Green Tomato Chutney and if you make it now you will have plenty for sharing at your Christmas Parties and you could even give some as a present to friends and family. 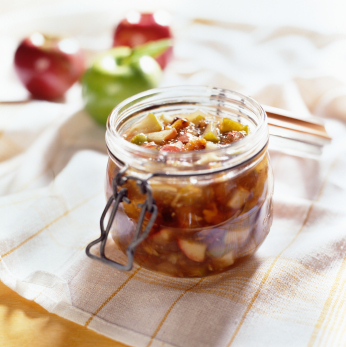 We hope you enjoy making this Apple and Green Tomato Chutney and more importantly eating it! 1. Put your chopped apples and water in a large saucepan. Bring the apples and water to the boil, turn the heat down, and allow to cook for approx 20-25 minutes, or until apples are soft, ensuring you stir occasionally. If you feel it necessary, add more water. 2. Put the mustard seed into a muslin or cheesecloth or something similar and then put the mustard seed enclosed in the muslin/cloth into the saucepan with the apples. Mix together the onions, green tomatoes, sultanas/raisins, garlic, curry powder, cayenne pepper, sugar, salt and vinegar and place the mixture in with the apples and wrapped mustard seeds. Keep stirring until the sugar has completely dissolved. 3. Allow the mixture to come to the boil, turn down the heat and let it simmer for 3 hours, ensuring that you stir the mixture occasionally and you get a thick consistency. Take the wrapped mustard seed out of the mixture and throw away. Tip: You can use old jam/pickle jars to store your Apple and Green Tomato Chutney but the jars with the metal clips and rubber seals would be a better option. This entry was posted on Monday, October 10th, 2011 at 2:23 pm	and is filed under Recipes. You can follow any responses to this entry through the RSS 2.0 feed. Both comments and pings are currently closed.